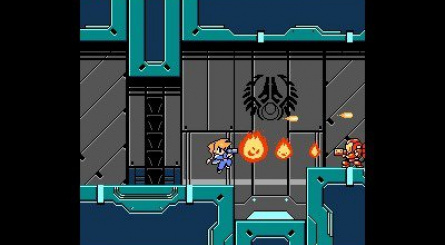 It's now been confirmed (thanks Tiny Cartridge) that this Mighty Gunvolt game will also be free for those that buy Azure Striker Gunvolt in North America. 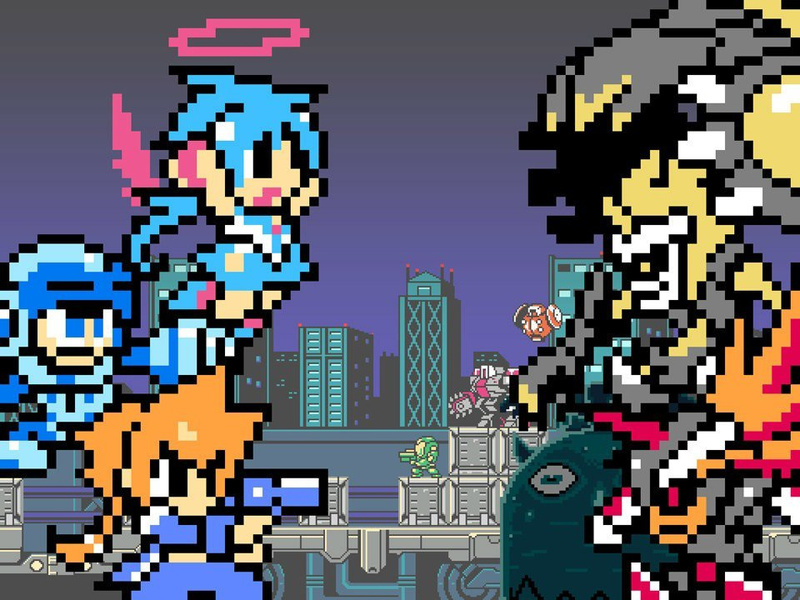 Fans of pixel-based 2D action games that happen to also be North American 3DS owners are surely on alert, as Azure Striker Gunvolt arrives in the region on 28th August. The latest project from Inti Creates, with consultancy from Keiji Inafune, it's certainly full of promise. Japanese gamers have an extra and free treat to go with the title's release in the country (20th August), and that's Mighty Gunvolt. 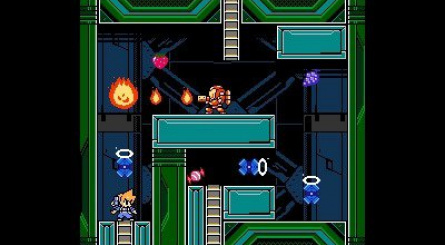 It's a rather neat cross-over — with awesome 8-bit styled visuals — with playable characters Gunvolt from Azure Striker Gunvolt, Beck from Mighty No. 9 and Ekoro from Galgun, and will also apparently have DLC of new bosses and stages in the future. 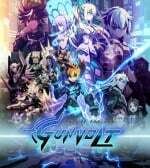 It's a free download for Azure Striker Gunvolt owners in Japan until 19th November, which gives even more 2D action for 3DS gamers to enjoy. Will this be included in the upcoming Western release? That's unknown right now, though we certainly hope that some details will emerge as we get closer to next week's North American arrival; Azure Striker Gunvolt is also planned for Europe, but there's no release window yet. 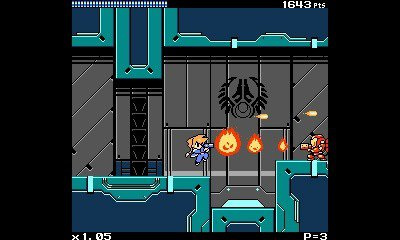 You can get a glance of Mighty Gunvolt at around the 4:30 minute mark in the video below, while a couple of screens are below that. So, just how much would you like this to accompany the North American release of Azure Striker Gunvolt? This game is a day one buy for me. Everything looks so good! I need a 3DS but I can't get one and I'm so frustrated! Holy crap i want this to be included in the EU version aswell! Reminds me of that Model Ancient minigame in ZX Advent! Looks fun! Man, that looks fun, would be the first time ever playing as Beck, no? This looks nuts. I was gonna put Gunvolt on my wish list and wait for a sale, but if we get this in NA I will buy day one. Damn, that's cool! I really hope it will come out in NA and EU as well! This looks better than the main game. 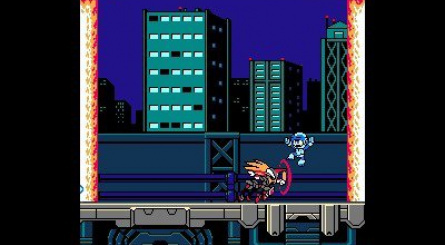 This looks amazing im already getting gunvolt day one so crossing my fingers this comes out in NA and EU! Day 1 and I DEFINITELY want this bonus. NA please! I want this more than the main game. As usual patiently awaiting EU release date. Let's hope western shores gets the same deal as Japan or at least a discount on purchasing the main game. 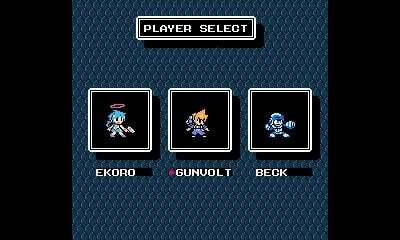 Mighty Gunvolt is all I need, please. @blaze8937 - Nice one for the info. Which pretty much means the same deal will apply in the EU. This seals the deal. Awesome! @ThomasBW84 What? 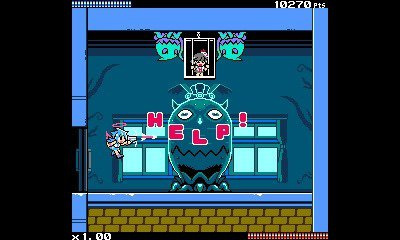 "It's NOT been confirmed (thanks Tiny Cartridge) that this Mighty Gunvolt game will also be free for those that buy Azure Striker Gunvolt in North America." So it's NOT coming to America then? @Olmectron It's now been confirmed was what I was going for. Possibly the worst typo ever on my part. @ThomasBW84 Thanks for your quick answer. It must be late night in the UK already, so that's understandable. No worries. Super excited to pick this one up now! @blaze8937 Excellent! Thanks for posting that. Made my day! @WYLD-WOO @Gen0neD Np guys always happy to spread the great news. If the reviews are positive I might get this day one on my 3ds. Wait so is this an extra mode or a separate game altogether? Also is this a promotion? Or can I wait to buy Azure Striker Gunvolt at a later date and still get this spinoff since I'm saving up for Hyrule Warriors at the moment. Woah! Finally N.A gets something cool for once. Obviously Europe will get it too but it feels nice that we get it first for a change. O.k this looks absolutely amazing..............But why the hell isnt it coming to the wiiu, I get so tired daily of something cool either not being on the wiiu or only being released in japan. Hopeing that the UK/EU Gets this game along with this cool extra retro game. 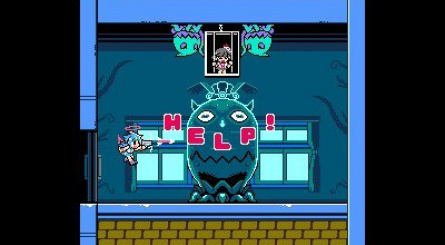 Oh, did they start officially covering Gunvolt's gut in the Japanese version, too? This game looks much more promising then Mighty no 9! Is this going too be a separate Icon on our Home Menus or will this be combined with the original Game itself? 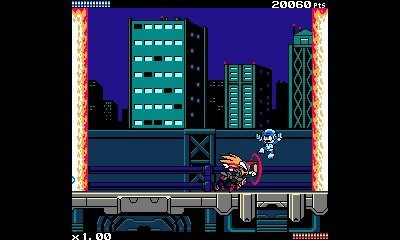 @Robo-Knight "It's a free download for Azure Striker Gunvolt owners in Japan until 19th November, which gives even more 2D action for 3DS gamers to enjoy." Sounds like it's a separate title.